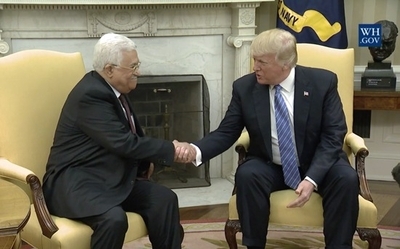 Speaking before Abbas, Trump said that "there cannot be lasting peace unless the Palestinian leaders speak in a unified voice against incitement to...violence and hate...All children of God must be taught to value and respect human life, and condemn all of those who target the innocent." Abbas then made statements that seemed intended to allay Trump's fears: "I affirm to you that we are raising our youth, our children, our grandchildren on a culture of peace," Abbas said. "And we are endeavoring to bring about security, freedom and peace for our children to live like the other children in the world, along with the Israeli children in peace, freedom and security." Apparently anticipating that Abbas would promote such falsehoods to Trump and the American public, Israeli Prime Minister Benjamin Netanyahu shared a video on his Facebook page exposing the extent of Abbas' lies. The video montage shows several examples of Palestinian incitement to violence – including by Abbas himself – and the indoctrination of children to hate and attack Jews. "Our strategic choice is to bring about peace based on the vision of the two-state," Abbas declared alongside Trump. "A Palestinian state with its capital of East Jerusalem that lives in peace and stability with the state of Israel based on the borders of 1967." But Netanyahu's video shows Palestinian children being taught that "Palestine is an Arab land from the river to the sea," effectively brainwashing them to reject the territorial compromise required by the two-state solution Abbas claims to accept. That anti-peace, anti-Israel message extends far beyond the classroom. "Every grain of soil in Palestine is ours... Haifa, and Jaffa, and Acre," (all cities in Israel), Najeh Bakirat, a religious leader and the head of the Waqf's Al-Aqsa Academy of Heritage and Antiquities said last June. "Therefore it is forbidden to relinquish a single grain of its soil," Bakirat continued, in his remarks titled "Palestine in the Quran," which were broadcast on official PA TV. While the Fatah-affiliated PA likes to present itself as more moderate than Hamas, its rejection of Israel is essentially the same. "The Fatah Movement never demanded that Hamas recognize Israel," said Fatah Central Committee member and Commissioner of Treasury and Economy Muhammad Shtayyeh, on official Palestinian Authority TV last March. "To this moment, Fatah does not recognize Israel. The topic of recognition of Israel has not been raised in any of Fatah's conferences." Abbas also didn't let truth get in the way of his breathtakingly false statement, made before Trump and the U.S. media, that the Palestinians "are the only remaining people in the world that still live under occupation." The Tibetans, Kurds, and Cypriots are just a few of the many groups who would disagree. Trump "raised concerns about the payments to Palestinian prisoners in Israeli jails who have committed acts of terror," said White House Press Secretary Sean Spicer. But a senior PA official rejected the idea as "insane," claiming that PA payments to imprisoned terrorists are like salaries paid to IDF soldiers. Just days before Abbas met Trump, senior Fatah leader Rawhi Fattouh even argued that donor countries should welcome PA payments to terrorists because this practice promotes peace by keeping the Palestinian terrorists from joining "ISIS or any other extremist party." A few weeks before the Trump-Abbas meeting, the Palestinian Information Center called Tel-Aviv a "settlement" in a tweet, implying that even Israel's commercial capital – considered well within Israel proper by international consensus – should be part of a future Palestine. Josh Block, head of The Israel Project, uncovered the tweet, which was released on Holocaust Remembrance Day. The Palestinian Information Center tweet referred to the "so-called Holocaust." The other major Palestinian faction, the Islamist terror group Hamas, has also launched a new campaign of deception to improve its fortunes – this one targeting Muslim powers. Hamas chief Khaled Mashaal unveiled a "document of general policy principles" at a press conference last Monday that appeared to moderate its anti-Semitic and genocidal charter. But, as journalist and Mideast expert Avi Issacharoff reported, it included no substantive changes (as confirmed in this more detailed analysis) and was designed merely to improve "public relations during one of the terror group's lowest points." "Gulf states are closing the funding taps one by one and income from inside Gaza is dropping," Issacharoff wrote. "It is for this reason that the need arose to present a 'friendlier face' to the world via this document of principles." Issacharoff calls it "a masterful example of verbal acrobatics in the Arabic language ... There is no direct call to eradicate the state of Israel, but recognition of the Jewish State is prohibited and liberated Palestine is to stretch from the Jordan River to the Mediterranean Sea." The Israeli government swiftly dismissed Hamas' charter revisions: "the group is trying to delude the world but it won't succeed," said a Netanyahu spokesman. "It builds terror tunnels and launches rockets — that's the true Hamas." Hamas also is trying to win hearts and minds in the European Union, which designated the Hamas military and political wings as a terrorist group in 2001 and 2003, respectively. As Issacharoff reports elsewhere, throughout Europe Hamas and the Muslim Brotherhood have created a network of schools, mosques, charities and other civil organizations. That network includes "student associations in every well-known university in Europe. Recently, Muslim 'human rights' groups have been established that work to strengthen support for the ideology of the Muslim Brotherhood and Hamas." Issacharoff notes that Britain is "hosting more of this semi-official activity by Hamas and the Muslim Brotherhood than any other country in Europe." Despite the EU's terror designation, Hamas also has a foothold in Germany, which reportedly harbors some 300 "members and supporters" of Hamas (along with 900 members of Hizballah "activists and members"). Its verbal and organizational deceptions aside, Hamas' actions confirm that nothing has changed about the group's bloodthirsty, fanatical, and cynical nature. Last month, the group used a girl with cancer to smuggle explosives into Israel for a future terror attack. Hamas accuses Abbas of "crimes against humanity" for his refusal to pay for Gaza's electricity as part of Fatah's struggle to regain control of Gaza. But Gaza's water and power crises are a direct result of Hamas' corruption, mismanagement, and diversion of humanitarian funds for terrorist purposes. Nearly three years after Hamas launched its disastrous 2014 war with Israel, thousands of homes damaged in the conflict – estimated at 60 percent of the total – remain unrepaired because of Hamas policies. Hamas has proven repeatedly that its commitment to jihad against Israel matters more than the welfare of the people it rules.